The idea of building a profitable online business is hugely appealing. You can create multiple secondary income streams working as your own boss, how, when and where you want. With enough time and effort that income could grow to the point at which you no longer have to work for others. But right now you’ve got commitments. You work. Family and friends want your time and attention. Chores need to be taken care of and bills need to be paid. Oh, and you want some time to do what you want, too. 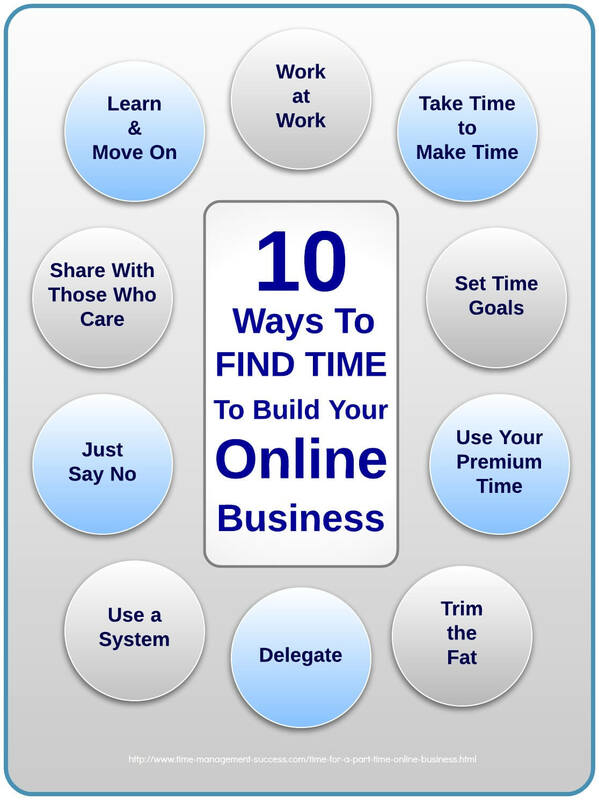 So how do you find time for a part time online business? More to the point, how much time can you give it, and what is the best use of that time? It’s tough, but it can be done. And, if you already have your own business I’m guessing you could use the time you spend on it more effectively. You could even carve out more time for it without compromising your other commitments. What you put into your business determines what you’ll get out of it. The more time you put into it, the more pressure on everything and everyone else in your life. The key is to find the balance between your commitments and ambitions. You have got time to do this -- you just need to know where to look for it. If you want to build your business in your own time, the temptation is to squeeze in a few more hours when your day jobs allows. But is it okay to work on it at work? Don't tell the boss, but I'd argue that it is. In your day job you may have windows of time that are ideal for working undisturbed on your business. As long as you do what you are paid to do, then it may be advantageous to take advantage of those opportunities to work on yours at work. The risk of course is that the lines between your paid employment and self employment become blurred. If you can adopt the mindset of Productivity Achieved rather than Hours Put In, then working on your business during the working day may be the right thing at the right time. This isn't for everyone. Some people prefer to keep the two separate, so it's something you just have to decide for yourself. The key is to maintain quality. If blurring the lines compromises what you produce, re-think it. The projects and tasks in your life flow from the commitments you currently have. Each commitment you cut, or at least reduce, means less projects and tasks. You’ll free up more time for your business. Think about the commitments in your life right now. Some, you’re in there for the long haul. Others, maybe you’re not so sure about. Then there are those you know you’re still involved with through force of habit. They're the ones to cut. Ask yourself this: would I rather keep these commitments or build my business? Take a good long look at your current commitments. If you’ve trimmed them down as much as you’re willing to, you should have carved out some time to build your ptob each week. Look at the rhythm of your week. Which days typically allow you the most time and which the least? Once you’ve got a rough idea of the time you can afford to invest in building your business set a monthly time goal to work on it. This gives you a challenging but realistic figure to aim for. The fact that it’s monthly means that you have a bit more flexibility -- if you’re off target you’ve got more time to catch up (or ease off if you’re overdoing it). To build your business you need to time to think, plan, create, produce and review. Some things can be done with other people around, but, in all honesty, not much. Most of what you do demands premium quality time. Look at your week and work out when and where the decent chunks of time are. Guard those times jealously -- they are your best, perhaps only, opportunities to build your business. Get set up for these times. Have everything you need ready so you don’t waste valuable minutes doing things that could have been taken care of beforehand. Get comfortable, make sure your environment is conducive to focused work before you start, then get to it. Every extra minute you build your business takes you nearer to achieving the level of success that satisfies you. And where do you find these minutes? By identifying where, when and how you waste time. A time log may seem like a lot of effort, but the reward will more than justify it. Even if you don’t do an in depth analysis of your time, be aware of when you’re wasting it. Fill those times with things you have to do so you can create large chunks of quality time to work on your business. It seems that there aren’t enough hours in the day. If you want to build a ptob you’re going to have to work hard, but it’s just as important to work smart. Do the things you only you can do; that applies to both your business and the rest of your life. As far as possible, delegate out as much as possible to other people. Get involved in timebanking to use your skills, talents and experience and benefit from others’. Hire a VA, use Fiverr or some other service to do the things you can’t or won’t do yourself. Put some time and thought into how you can reduce, remove or outsource tasks in your life that prevent you from building your business. Sometimes things appear in your mental inbox and stay there. If you want to build this business, you’ve got to make yourself leaner and meaner. Don’t let things build up; have a system to process the things that are worth taking care of. Once you know how to do this you’ll find you take care of things when they show up rather than when they blow up. You’ve got to make a few sacrifices. Some things you’d like to do need to be shelved for now. I’m not saying you won’t ever do them; just think carefully before you say yes to the things you’d like to do, and be firm when someone asks you to do things you wouldn’t. ‘No’ is such a powerful word. If you can use it wisely and well, it will buy you many hours of business building time. Who needs to know you’re doing this? Are you the sort of person who thrives on the pressure of people knowing what you are doing? Personally I prefer to keep it under my hat as much as possible. But some people need to know, especially those people you live with. Everyone benefits if they know that you need time to work. They’re more understanding, and you’re free to focus without the guilt of knowing you’re trying to conduct a clandestine operation. Every week or so review how you’ve done. Where were your time sink holes? Identify where you wasted time, learn from it and keep moving on, step by step. Every venture worth undertaking is challenging, and failure is part of the process.